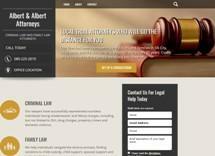 As a client of Albert & Albert Attorneys, you will benefit from working with one of the region's premier law firms. Our partners, Mark and Paul Albert, bring more than 60 years of combined legal experience to the table in all types of civil litigation, criminal and transactional matters. At our firm, you will receive representation from a compassionate lawyer who is dedicated to helping you successfully resolve your case. While many of the types of cases listed above can be handled through effective settlement negotiations, sometimes you do not receive an offer of a fair resolution. Whether it is a divorce, car accident or DUI charge, our lawyers will not hesitate to take your case to trial if necessary. An advantage of being our client is that we are never unprepared; we prepare for every case as if it will head to trial. Call Albert & Albert Attorneys today at 580-303-4054 if you would like to schedule a consultation with one of our experienced attorneys at our office in Elk City, Oklahoma.